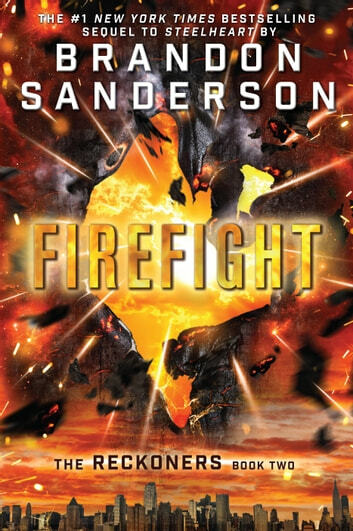 This book was full of twists and turns and it was fast to read, and Brandon Sanderson uses a perfect mix between humor and action. It's been a long time since I read a book that I really struggled to put down, an even if this one didn't really reach the whole way to the top there, it was one of the better ones in a long while. I do find it a bit dragging towards the middle and at the end, but at the same time the ending part may just be because I was too eager to find out what happened and didn't have the patience to wait for it. And this time I remember the main character, David (unlike after the first book in the series). I also loved how he evolved in this one and how things about the Epics got more explained to the reader. I love the way Sanderson have developed the main character, and the way he has made us see this boys nerdy personality (even if David himself hates being called a nerd). He's such a fun character to follow in this book and his language is what brings light into an otherwise dark story. The writing is superb and it makes me curious to read more book by the author. I like this book a lot better than the first one in the series, Steelheart, but I also believe that I needed the knowledge from Steelheart to enjoy this book too. So if you want to read this series, do it in order. Judging by the name though, I thought the book would be more about Firefight than what it was, but at the same time I like the setup just the way it is. And the ending made me want to read more, so now I'm just waiting for the third book to come out. In addition to the characters themselves, I love the atmosphere Sanderson creates in the Reckoners series. Fabulous book, had me twisted in a knot by the end. I didnt know what was going to happen. If I was an Epic it would be to write a story and have it come true, my fear, would be to read his re-write and see how bad my story telling skills were. I hope he really brings it in "Calamity". Pretty funny, the character interaction is fantastic with a great twist at the end. Another great Sanderson novel.